Designed to give a never before bathing experience. Made from High Grade Material for superior looks and prolonged durability. Complete Pack of Health Faucet with Tube & Wall Hook. Size (Inlet Cnnection) - 15mm (Inner Thread). Anti Corrosive and Easy to Clean. 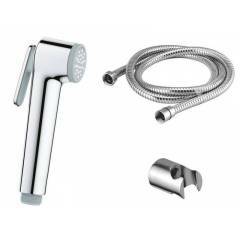 Kamal Oreva Health Faucet with 1m SS Flexible Tube, HFT-0429 is a premium quality Health Faucets from Kamal. Moglix is a well-known ecommerce platform for qualitative range of Health Faucets. All Kamal Oreva Health Faucet with 1m SS Flexible Tube, HFT-0429 are manufactured by using quality assured material and advanced techniques, which make them up to the standard in this highly challenging field. The materials utilized to manufacture Kamal Oreva Health Faucet with 1m SS Flexible Tube, HFT-0429, are sourced from the most reliable and official Health Faucets vendors, chosen after performing detailed market surveys. Thus, Kamal products are widely acknowledged in the market for their high quality. We are dedicatedly involved in providing an excellent quality array of Kamal Health Faucets.